Trade deals worth more than 1 billion yuan ($149 million) have been signed during Kaohsiung Mayor Han Kuo-yu's first visit across the Taiwan Straits, selling the city's agricultural and fishery products to mainland cities. "These achievements reflect that the two sides belong to one family, fully demonstrating that on the basis of adhering to the 1992 Consensus and one-China policy, city exchanges across the Straits have broad prospects," An Fengshan, spokesman for the Taiwan Affairs Office of the State Council, said on Wednesday. Han, a rising star in Taiwan's Kuomintang party, arrived in the Hong Kong Special Administrative Region on Friday, leading a delegation of about 30 officials and business executives from Kaohsiung. The weeklong visit by Han, who assumed office in December, includes the Hong Kong and Macao SARs, Shenzhen in Guangdong province and Xiamen in Fujian province. The trip is scheduled to conclude on Thursday. Han and his group signed agreements worth 400 million yuan during their stay in Shenzhen and Xiamen, over 500 million yuan in Hong Kong and about 160 million yuan in Macao, according to the spokesman. 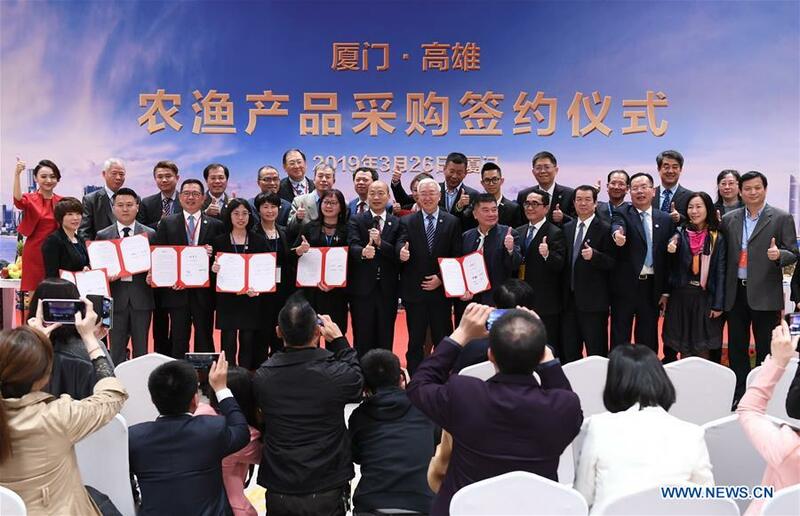 "The agreements on selling Kaohsiung's agricultural and fishery products to mainland cities were signed in accordance with the market-oriented operation mechanism," An said at a regular news conference. Kaohsiung was also invited to join trade and culture exhibitions held in Xiamen every year, including the Straits Forum and China International Fair for Investment and Trade to boost economic ties. Xiamen will hold cultural activities, including a South Fujian dialect chorus show, in Kaohsiung, according to An. In addition, Shenzhen will provide 200 internships and jobs for young people in Kaohsiung every year. Xiamen Air will visit Taiwan again this year to recruit 200 flight attendants, and 100 spots will be set aside for Kaohsiung, he said. Travel agencies in Shenzhen and Xiamen will be encouraged to organize tours to Kaohsiung under the market mechanism, and 8,000 tourists are expected to travel to Kaohsiung in groups, An said, adding Xiamen-to-Kaohsiung cruises will be arranged as soon as possible. The spokesman said that through the trip, a consensus was reached on building a cross-Straits city exchange mechanism, showing bright prospects for strengthening cooperation with Kaohsiung. "We support more cities on both sides in strengthening exchanges on the basis of the 1992 Consensus and working together for development, so our compatriots in Taiwan will have a greater sense of gain," he added. Speaking of the criticism from the Democratic Progressive Party and some "Taiwan independence" forces on the visit, An said that the DPP administration's obstruction and interference in cross-Straits city-level cooperation exposes their true motive, to damage Taiwan compatriots' interests and well-being for their own ends. "Only when cross-Straits relations are good will Taiwan be better," he said. "We hope that compatriots on both sides will oppose 'Taiwan independence' and actively promote the peaceful development of cross-Straits relations."